The San Francisco 49ers, my favorite football team, made it to the Super Bowl five years ago and my wife and I hosted a family Super Bowl Party. It was getting close to the end of the game and most of us were glued to the TV in our family room when my six-year-old granddaughter decided to take her notebook electronic device to a quiet room on the other side of the house to play a game. She was soon followed by my two four-year-old granddaughters who each asked their respective Mommies if they could borrow their cell phones. The sun went down while they were concentrating on their games and there was little light in the room but they didn’t care. They had enough light from their devices. I went to check on them during a commercial break and shot this picture. 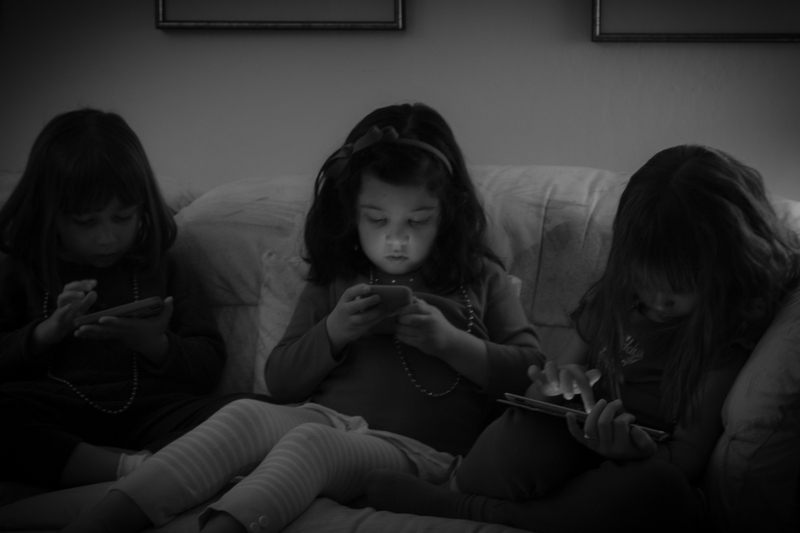 My three granddaughters and their electronic devices while the rest of us were watching the Super Bowl game. The two on the left borrowed iPhones from their mothers. Click on the photo to see a larger version of the photo. Australian photographer Leanne Cole hosts the weekly Monochrome Madness Challenge and for the first week of every month she suggests a specific theme. This week’s theme is Telephone. Drop by Leanne’s website on Wednesday (Tuesday in North America and Europe) to see how Leanne and other photographers from all over the world have interpreted this theme. My Niners lost the game that day and have been pretty miserable ever since. Last year for the first eleven games of the season they were 2 and 9. But then they traded for a new quarterback and won their last five games. Maybe we will be hosting another Super Bowl Party soon! Go Jimmy G! I am a family man with interests in family history, photography, history and travel. This entry was posted in California, Family History and tagged 2013 Super Bowl, Leanne Cole, Monochrome Madness Challenge, photography, San Francisco 49ers, Telephone theme. Bookmark the permalink. I’d wish I had this kind of focus and undivided attention which these little girls have when playing their games. Best of luck for your favourite football team! I like how you captured the device’s light illuminating your granddaughter’s face. Digital Glow! The look very into whatever they’re watching or playing. My Grandson is the same. Great image! !